View all of Bobby Conner's scheduled events. Read the latest articles written by Bobby Conner. Browse and purchase Bobby's published work. Browse free and subscription-based media from Bobby. Browse upcoming School of the Supernatural events. Support Bobby Conner by becoming a Partner. Standing in the Council of the Lord! 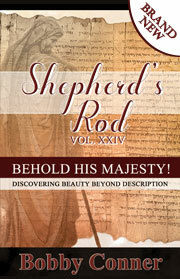 Now Available, the 2019 Shepherd's Rod! The Spirit of Truth said; “This year’s Shepherd’s Rod will be about the Saints of God beholding the Beauty, Splendor, and Majesty of Christ Jesus on a level not previously known, this will result in brokenness, bringing the saints to tears of anguish over our blatant neglect and lack of love demonstrated for Christ. Yet, we will weep tears of overwhelming joy! The Body of Christ has grown cold in our passion for Christ (see Matthew 24:12). Take heart and be encouraged because this is about to radically change. In this 2019 Shepherd’s Rod, I will reveal the insights concerning this upcoming experience. Thank you for your desire to partner with us at Bobby Conner - Eagles View Ministries. Whether you choose a one-time donation or become a monthly partner, know that your support is greatly appreciated. Now more than ever, is the time to invest in the Kingdom of God for His glory!